Dropping into the old Quarry at Northwest OHV. Ok, it seems longer than that. A few weeks ago, around the beginning of July, I saw everyone from the book of faces getting ready to head to Colorado for the FJ Summit in Ouray. I was jonesing to get out and wheel. I put out an “event” on my TXpedition page on Facebook to gauge some interest and had a lot of folks responded. As time went on more and more people confirmed, so it was a go! Friday night had me loading my recovery gear in the back of the FJ and strapping it down. Saturday morning had me up bright and early drinking coffee and filling up a cooler with Topo Chico’s (Mexican Mineral Water) and limes for the hot day ahead. The weather was forecasted to be in the 100’s and the heat index making it 106 degrees. I hit the road right before 7am, a little later than I wanted but still early enough to get me to the park around opening time. Driving to Bridgeport, TX always fills me with anticipation of a good time. This was the place I first took my rig off road (Not including Thanksgiving 2013 when I high centered it on a dirt access road and almost ruined Thanksgiving dinner… But that’s another story). I checked in at the main gate, paid my dues and signed away any chances of holding the park responsible for anything stupid I might do. As I pulled into the main staging area, I saw some familiar faces and new rigs. I counted about 14 in total. 5 more than expected and 2 or 3 more were going to be late. I pulled in and started airing down. Then went and socialized for a bit, meeting all the folks I don’t know. 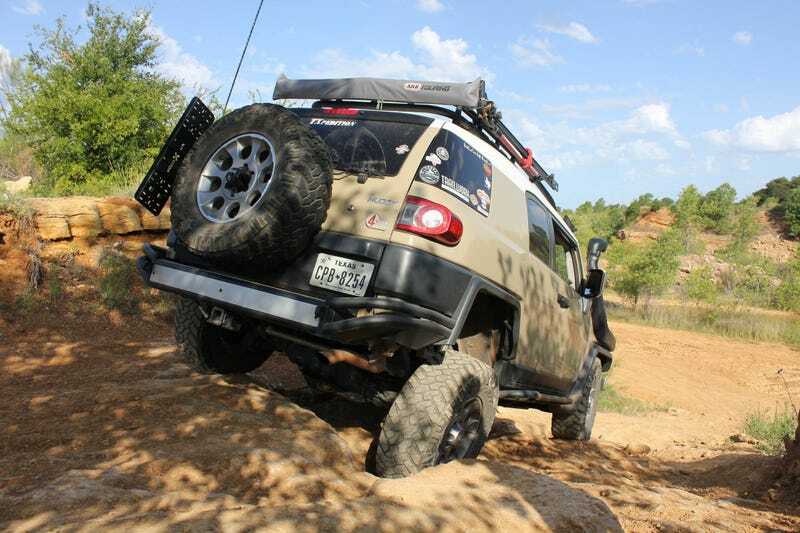 We had some folks from the North American Soft Roaders, Texas Overland, DFW Overland, Texas FJ Cruisers Facebook group and some others that confirmed through my TXpedition page on Facebook. Dennis and crew, ready to wheel! More folks rolling into the park. There was an Isuzu Trooper Turbo Diesel, 4Runners, FJ Cruisers, Tacoma’s, a Jeep Rubicon and a RAM Pickup 4x4 on his first time off road. Oh, and a Mercedes Unimog. So at 8:55am we rallied the group together, I introduced them to Dennis, who was more familiar with the park than I am. He volunteered to lead us around the park. I made a half assed speech and we hit the trail. Our goal was to do some easy – moderate trails. We aimed ourselves toward the power lines and find the “Steps” that go down into the southern center of the park. Well, the Steps were eroded to the point of being big boulders now, not steps. Even some of the easier descents were washed out and not suitable for beginners. We doubled back and thought we’d hit the “Spider Web” which being hot and dry, should be easy for the new guys. Our Trail Leader found out otherwise. We learned 2 things that morning: The park changes dramatically with each passing rain shower and 14 rigs on those short trails are way too many for this smaller park. Since we had a varied group, we decided to head back to the entrance and split into groups of skill levels. I volunteered to take the newer folks out and wound up with about 9 rigs plus mine. Still a big group to navigate this park, but manageable. I took everyone down into the old quarry and we found our way up on the south side coming down a decently rough hill. I got out to spot a guy and ended up spotting everyone down. Damien tackling the hill into the quarry. Next we crossed back to the other side of the quarry and climbed the trail to an area I call “Tatum Hill”, after a local legend that always took us new guys to it and taught them how to wheel it. Weather has changed the hill over the years, but it’s still there, ready for a climbing challenge. To get to Tatum Hill, we had to navigate all the new folks over a series of 3 mud pits that were half dried. I got everyone including a full sized Ram Pickup and a Unimog through. He broke off a piece of his mirror mount on the tree. Next was to inspire some of the folks to climb up what they were nervously looking at. I dropped the FJ in 4lo and slowly crawled up the hill. My back wheels spun out on me half way up, so I stopped and engaged the rear lockers and voila! I crested the hill and turned my wheel right to traverse the top. One of the crew had run up the hill alongside me and I asked him to spot me down. I got out of my rig and showed him the line I wanted to take and he helped me over the hump going down. I always freak out when I’m about to head down a trail and can’t see over the hood. After I went up and down, my buddy Damien gave it a go. If I remember, this is his 2nd time out wheeling… at least the 2nd time he and I have wheeled. Well he climbed up and took the same trail down. Next was a Lexus GX40 that was decked out. Everyone went up and down that wanted to, so we next went back out the way we came through the mud holes and headed a little farther west into the park. The 3rd left off of the main access road will take you to the Western fence line. From there you can turn right toward a tougher section of the park near the Minos Trail, where there is a hill I have yet to conquer. We went left along the fence line. It takes you east for a bit, then a sharp right drops you south, still along the edge of the park. The trail is bumpy, slightly rocky and rutted out from when it rains and everyone thrashes along this trail. My destination is another little plateau with a small climb that is great for photo ops with your rig. I got everyone down the trail and up the hill so that we could all do a group photo. By this time it was almost noon, the planned meeting time to head out to lunch. I got the troops rallied up and headed down the trail, which led us back to Tatum Hill, those mud holes and the main staging area of the park. Lunch time found a few rigs heading home, as it was almost 100 degrees out there. The rest of us ran out of the park to Rock City Burgers, a local burger joint that cooks burgers to order and has some of the best onion rings and fried pickles around! After my Jalapeño Bacon Cheeseburger and pickles, some of us decided to continue wheeling despite the heat. About half of the lunch crowd got smart and beat the heat by heading home. I’d say about 7 rigs headed back to the park and straight to the power lines. There was a trail there that went up on the north side and traversed along the top of a small rise, back to the main road. My goal was to keep giving the beginners some challenging trails, yet conquerable ones. We spent the next hour finding said trail then going up and down it. I went up one trail trying to scout it out and realized half that group wasn’t skilled enough yet. I had to find my way down while the rest of them backed out the entrance I had just gone up. One trail over was the one I was looking for, so the rest of us climbed up it and back down the other side, about 100 yards of rocks and ruts. We noticed rain clouds and squalls in the distance and decided it might be a good time to get to the entrance of the park and air up. To be honest, I was hot, tired and damn near getting heat stroke, even though I was drinking tons of water. Looking out over the “steps” at the powerlines. Rain kept getting closer. We had a great day and hopefully the group will come back out to wheel again… when it’s not 100+ degrees! The next weekend found me in the Texas Hill Country relaxing on a porch, watching the sunsets with a Martini in one hand and a cigar in the other.